A highly detailed survey of the real-life Wallace Murder Case from Liverpool (1931), which re-examines all the evidence and suggests who the perpetrator might have been. The Wallace Case is a famous murder case from the 1930s which was never solved. This book looks in exhaustive detail at all aspects of the murder and carefully evaluates the numerous theories that have been put forward. I particularly enjoyed the descriptions of the life of the Wallace couple who lived in a grimy terrace in 1930s, Liverpool. The details of 1930s tram rides, the value of insurance premiums collected by Wallace, the grim bathroom and toilet of the house, all build up a really different style of living to that which exists now. There was an important phone call during the case which came from a phone-box, that is fascinating; as in Depression era Liverpool, the need to use cash frugally was paramount. Five theories are examined as how Julia Wallace was brutally murdered by heavy blows, to her head while alone in her own parlour. There have been a number of people who have published books or articles on the crime including P.D. James and Dorothy L. Sayers; and these are all acknowledged at the end of the book with the verdicts. The somewhat flawed investigation by the Police, that lead to her husband being tried for murder (and the results of his trial) are also considered in detail. The reader is provided with photos of the buildings, plans and descriptions of the exhibits used in the trial and the witness statements. Finally, the author reveals his own theory and exhorts readers to visit the Cold Case Jury website for Move to Murder and to cast a vote for the theory that they regard as the one most likely. 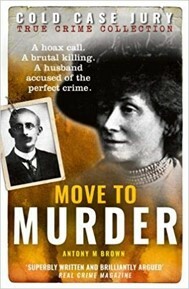 Move to Murder is an excellent re-evaluation of a fascinating case which is open to many interpretations. The level of detail can get a little overwhelming at times, but it does bring the case into focus. The author allow himself the licence to reconstruct possible conversations, and to attribute thoughts to the potential protagonists. This book is the third in a series called Cold Case Jury by Anthony M. Brown. I rather liked his use of chess terminology since this was a hobby of Mr. Wallace and the whole series of events began with a phone call to the chess club by a man who gave his name as Mr. Qualtrough.